If you are reading this, you have already taken the first step to organizational recovery. I am proud of you. High five. It has been a long road of a thousand post-it’s that no longer stick but somehow manage to linger on and around your desk; Emails from six months ago from someone in a third world country asking if you want to send money for their dying grandmother and has absolutely no relevance to your actual job; and finally, a workload that would require Tony Stark to link up with Doc from “Back to the Future” to create some insane technology or vortex to accomplish everything in one day that seems to fall on your plate. I think we get the picture. In all honesty, we do it to ourselves. We take on too much because we refuse to say no and doggy-paddle the hell out of most days to keep our head above water. We also forget that we don’t have to overcomplicate things. Sometimes you have to go back to basics to remember you have not completely lost your sanity. Here are the top 3 organizational challenges I see in most workplaces and some helpful tips I use to combat them. Maybe you decide that every two hours you will stop and look at your email and the other two hours is for heads-down work. Whatever it is, create a system to where you know that you will have time to check your inbox and also get work done. The trick is that you have to stick to it. Get bossy with your life and your inbox. Yeah, you heard me, ask for help. Don’t be afraid to ask your teammates if they can help you respond to emails while you are away or are heads-down in some marvelous experiment that is going to cure cancer. Coworkers and teammates are there to help everyone be successful, so use them and let them know they can use you too. Some people love this, some people hate this. To each their own. However, I can see the benefit in having these folders and rules. I know people who set up rules so that when emails come from a certain person, place, email address, etc. it goes directly into the folder they set up to correlate with that mail. This works perfectly with the cadence discussion we talked about earlier. Have your email do the organizing for you with rules and create a cadence throughout the day to look at anything unread in those folders. Easy-peasy. Who reading this blog leaves for the day and doesn’t go through their emails to ensure nothing was missed? Raise your hand even though no one can see you. I am going to say this in my mother voice – You need to change that. Signing out for the day with unread emails floating around and chaos ensuing only means you have to deal with it plus more the next day. I am not saying you have to be at inbox zero, but at least be close to an “inbox where I have read everything” or maybe even an inbox 20. I am an inbox 20 girl. This really is my biggest tip. Go through your emails before signing out and know that anything after that you really, truly can tackle the next day. You have a life outside of work and you should enjoy it and not stress about the piles of emails taking over your inbox. Reviewing all emails before the end of the day may be my best tip, but my favorite is determining priorities. When going through your emails, delete the ones you don’t need, file the ones away that you need to keep for reference purposes and leave the ones that you need to follow up on or are urgent to respond to the next day in your inbox. If you apply this tip when going through emails in general, your life will become immensely better, like attending a Michael Jackson concert in the 90’s better. Do you work for a company where schedules can get out of hand and you have no idea if the person sitting next to you has even had a chance to take a bathroom break in the past 8 hours, or if you have even had a chance? You know it’s bad when you forget about yourself. If you do, don’t worry, there is hope. Follow these basic tips and get some breathing room back in your day. At some point, you have to ask yourself, “how much can I really do?” You have to set limits. Start by setting a meeting to work ratio. Historically, I have seen people schedule 4 hours of calls a day with 4 hours of work time. The ratio is completely up to you, but you have to set it, you have to voice it and you have to stick to it. Oh, how I love me some “do not book” blocks on a calendar! I think they are the greatest thing since sliced bread. Once you have determined your meeting to work ratio, make sure you schedule “DO NOT BOOK” in big capital letters where you have deemed work time. This will help the challenge of people looking at your calendar and thinking you are free and then scheduling time that you really don’t have. I think color coding is underrated and deserves more love. There is nothing worse than opening up someone’s calendar that is completely packed and having to click on every meeting invite to see what something is really about or who it is with. Honestly, my eyes glaze over, and I shed a tear every time I see a calendar like that. It hurts my project management heart. The name of the game here is efficiency. Create a coding system that works for you or your team and then implement it. You will thoroughly enjoy being able to look at each other’s calendar at a quick glance and know who they are meeting with or what they are talking about. Some options may be to color code by your clients, topics or internal individuals. This tip needs no introduction. Be smart and aware of what appointments you have on your calendar. If you have clients that request a lot of meetings, make sure to broach the topic with them of consolidating. In a lot of cases, it is a win-win. You get more solid blocks of time back in your day rather than 30 minutes here and 30 minutes there and your clients get a good chunk of time with you and the value you bring them. Whether it is a notepad, Microsoft OneNote, EverNote, etc. write it down. Get it out of your brain and onto something tangible so you don’t stress yourself out trying to remember. You can take it a step further and write it down with a due date or deadline you want to have it done by. This will help set you up for success when others need something from you. You can visually see what you need to get done and whether or not you have time to dig into the new ask. Let’s not get crazy and say no to everything with no real reason other than we are tired from too many glasses of wine the night before and are not feeling the whole work thing that day. However, do learn to feel confident enough to push back on those around you, internal or external when something cannot be done in the time they are asking for it. It should go without saying, but when you say no, make sure you have options or alternate solutions that can help alleviate the challenge and still aid in solving the problem. It is wise to remember that being a “yes” person only hurts you and those around you in the end. I have come to find that when I push back or say no and offer alternatives, those asking really are ok with giving me more time, space, or resources to get things done. Honestly and transparency can go a long way. Do not wait till the last day something is due to truly look at what needs to be done only to realize you don’t have anything you need. Be proactive and own your days. Look at what you have happening 1, 2 or even 3 days out and make sure you have what you need to complete it. If you look ahead and try to get what you need and it won’t be provided to you in time, then it becomes a lot easier to reprioritize tasks and initiatives without feeling guilty. Remember, today’s problem will become tomorrow’s problem if you fail to be proactive and use the resources you have. There you have it folks, some simple tips to keep you from losing your sanity. I hope you all feel inspired to stop doggy-paddling through the work week and enjoy some nice breathing room while you relax on your unicorn or pink flamingo floatie. 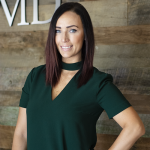 Stacy Smith brings a competitive and knowledgeable attitude to an impressive LeadMD team. She has gained extensive techniques and qualities over the years while working in a wide variety of industries to perfect her Project Management skills. Her passion for organizing situations, events and teams comes from a long background of sports and community service where the end result was to accomplish growth and the internal/external well-being of others. Stacy prides herself on getting the job done and getting it done correctly, while remaining upbeat and having a humorous attitude. Too often, you can hear Stacy butchering an everyday common saying. These quirks make her human, trusting and a valuable asset to the LeadMD team. In her personal life, Stacy enjoys anything involving sports. She was a three-sport athlete in high school and accepted a scholarship to play NAIA college softball. She is also a huge traveler and loves visiting all locations that the world has to offer. If she is not traveling, you can find her cooking, hiking or spending time with her family, friends and dogs.